Blackberry's stock price crashed by almost 30% late last week as the company announced Q1 results that missed estimates. While revenue and shipment figures narrowly missed estimates, the company announced an unexpected loss with a warning about further losses. Apart from the loss, there are a few other data points that paint a bleak picture of the company's prospects. 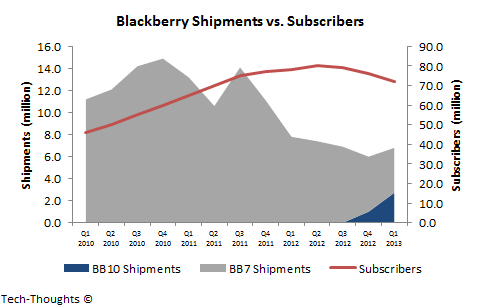 The chart above shows the historical split of BB10 to BB7 shipments and compares them to the outstanding subscriber base on Blackberry devices. The first worrying sign here is that the shipment pattern looks somewhat similar to that of Nokia's after the Lumia launch, i.e. BB10 shipments are barely making up for the drop in BB7 shipments. The second ominous sign here is the state of the subscriber base. The company announced that they lost 4 million subscribers this quarter, which means that the company has lost nearly 10% of its subscriber base in just two quarters. This suggests that nearly all BB10 sales have gone to a small portion of existing subscribers and that the company may not have the ability to bring in new consumers. The company nearly confirmed this by announcing that subscriber figures will not be released from the next quarter. Since Q1 was the first full quarter after the BB10 launch, which focused on high-end devices like the Z10 & Q10, the ASP was bound to go up. This happened in the previous quarter as well, as the Z10 began shipping to the channel. However, the gross margin registered a surprisingly sharp drop. While the drop in services revenue certainly played a part, the drop was no greater than what we saw in previous quarters. This could either have been caused by sharp price cuts or more likely because of an inventory build-up caused by low sell-through. We may need to wait for Gartner's smartphone sales figures for the quarter to confirm this hypothesis. 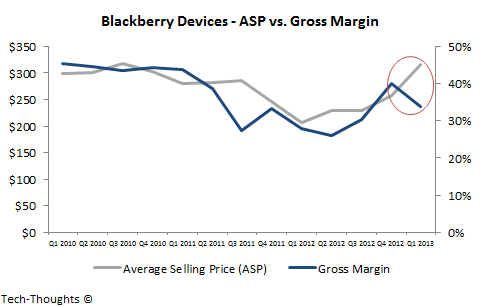 Services have long been the backbone of Blackberry's business strategy and the primary reason for its high gross margins. However, this strategy has been weakening as the company has lost ground in the high-end smartphone market. 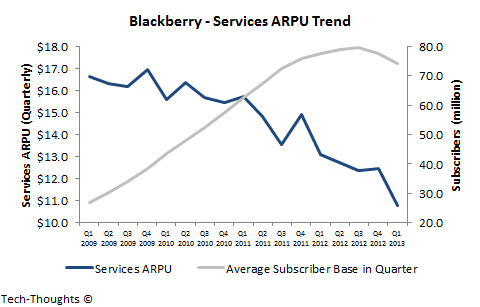 Services revenue and ARPU has been dropping for five consecutive quarters, with no end in sight. Blackberry's strategy with BB10 devices was aimed at high-end consumers, but that strategy has not helped stem the decline in services revenue. It seems like the majority of remaining subscribers are those in emerging markets and make very little use of Blackberry services. This puts Blackberry in the same position as Nokia's feature phone division, i.e. in direct competition with low-end Android vendors. Given the cost structure of competing OEMs, I find a successful transition to BB10 very unlikely.